Not long ago, in a land called Alba, a city named Edinburgh, Four Tasters of the Apocalypse were reunited once again. 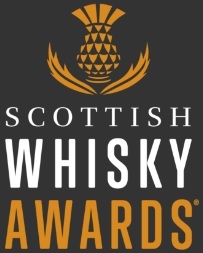 They embarked on a quest, a mission, a journey to sample golden liquid from four corners of the Sacred Country and by so doing, to fight the Evil and perhaps to conjure the spirit of Douglas MacIntyre. Their names were Chris, Euan, The Mole and Lucas. They proceeded. He, who travelled from the West and the North, drew the Unholy Pentagram on a black marble floor of his temple on Monague Street. Ribbons of purple smoke rose from still unlit candles. Black clouds folded over Edinburgh skies. Five Virgin Slaves entered carrying Artifacts. Cautiously and in silence they placed them on the five corners of The Symbol. 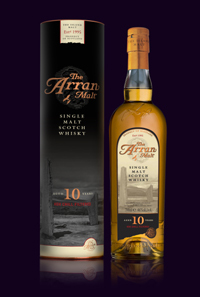 Malt from Arran aged for ten years pointed towards the sea, the lover and the doom of the youth. 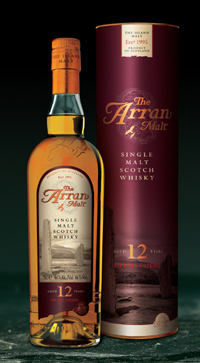 Arran aged for twelve years pointed to the volcanic hills, older than the oldest of us, older even than Abraham. Arran aged in Pinot Noir barrels pointed to the South and the East, the land of Teutons, where his mother traveled from to be with his father and to give him birth. Water, the beginning of all things living, looked to the heart of Alba, where all the water had its spring and where all the water will meet its end. And at last The Fifth, oatcakes, looked towards Lucas who soon would be united with them for ever, of which he knew and they did not. By this Divine Intervention they were left shameless and true. Tempting and luring The Braves. Chris raised his hand… they flew. Palate: Opens so sweet and vanillish with a touch of light fruit. With water a hint of chewing gum. You could just hold it in your mouth for ever. So approachable. 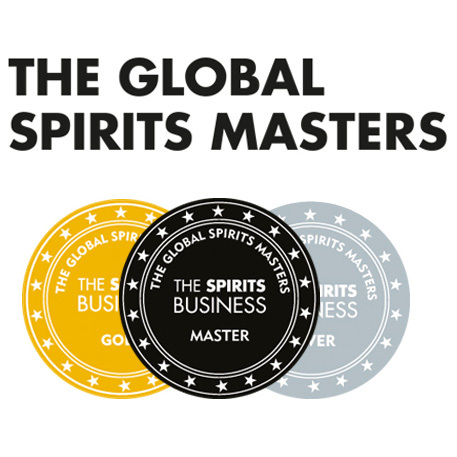 A quintessence of the core of the range, drinkable spirit. Thoroughly enjoyed. Overall: Truly Holy! Superb stuff, not a flaw in it. And you can’t argue with the quality-to-price ratio. Full marks. Lightness ripped through the black skies to the West. A thin and weak line still, an Angel’s hair. A symbol of hope to those who doubted, to those who were afraid. Five pairs of bare feet sounded softly on the marble floors. Through unclosed bronze gates the Virgins peeked into the hall where The Four were gathered. They dared not enter, they observed in awe. Nose: Not unlike the 10yo, but has a slight hint of Jura in there. ‘The Juron’. You could call an off note, but it’s not really. It’s less sweet and a touch oakier than the 10 too. Palate: Again you can see the Arran signature, but it lacks something. It’s a bit bitter and it tastes like it already has water in it. Overall: Perhaps there is nothing wrong with it, it’s just not nearly as good as the 10yo. The light faded, they could barely see it. High above the clouds The Four could hear a battle roar, armies of Good and Evil clashed. But the brave hearts of The Tasters knew no fear. Hope was with them. The son of the North and the South, the Subtle and the Strong, the Light and the Dark would sacrifice himself in this struggle. But which path would he choose? The Virgins, silly things, got scared and were nowhere to be seen. Nose: Chocolate pudding with brandy butter. Prunes, slightly burnt Christmas cake, grapefruit, chocolate with rum raisins and bran flakes. Chris gets feet (he’s already on the Dark Side…). Palate: Strongest initial flavour ever. Crazy. Chocolate berries. No alcohol bite for 50% ABV. Ridiculously sweet and good. Finish: This is where it actually tastes a bit winy. Overall: Elegant, excellent, eminent. A true highlight of the range. The impact of the cask is immense. The Virgins were woken up by rays of sunlight filtering through stained glass windows. They looked at each other with a mixture of shame and joy. Birds were singing on Montague Street. The marble floors were not cold any more as they ran down a wide corridor, their breasts covered with their hands. They burst into the hall where the fate of the universe had been decided. This entry was posted	on Friday, August 21st, 2009 at 12:01 pm	and is filed under Reviews. You can follow any responses to this entry through the RSS 2.0 feed. Responses are currently closed, but you can trackback from your own site.